Maplewood and Durand-Hedden Remember the Great War - November 19, 2017 ~ The History Girl! Join Durand-Hedden on November 19 from 1:00 pm - 4:00 pm as we observe this historic event that changed the world, the United States, and our town. Join a WWI reenactor portraying a Marine sergeant as he reveals the life of a doughboy; and view a soldier’s kit and antique firearms. 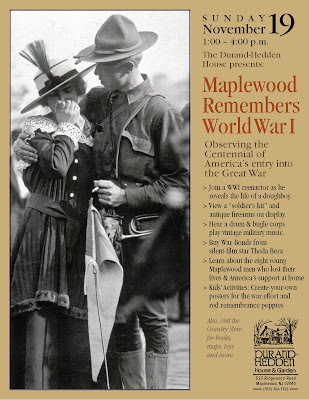 Hear an authentically attired drum and bugle corps from Early Music and Arts play military music of the period plus the spirited “Over There,” and meet silent screen celebrity “Theda Bara” as she speaks about her work selling war bonds and visiting the wounded. Interactive activities for young visitors include designing patriotic propaganda posters and making red paper poppies symbolizing remembrance.